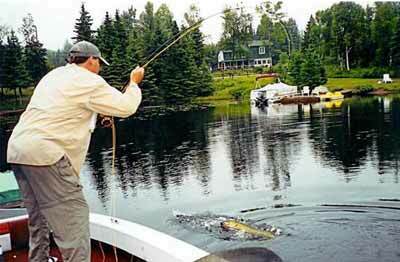 IN THE VAST WORLD of fishing, fly fishing for muskie is definitely considered out on the edge. Known for their often massive size, violent head-shaking strikes and razor-sharp canines, muskies are not for the faint of heart. This is one species you don’t want to get too close to without the proper equipment. In fact, in the old days muskie fisherman actually used to shoot their fish in the water before ever bringing them in the boat. On the other hand, if you enjoy casting big 2/0 flies all day just for a chance to see a huge fish grab your offering — often right at your feet — then this might just be the sport for you. For me, it all all started when I caught my first muskie in Northern Wisconsin on the appropriately named “Mepps Giant Killer” spinner. I was fishing with a well-known muskie guide and had high hopes for the day. After seeing a few fish follow my lure through the early morning lake-mist I finally connected with a small but legal fish of 32 inches. Later that morning I actually hooked and landed a real trophy-class fish of 45 inches that was over 20 pounds. I was, as they say, hooked for life. Shortly thereafter I began to wonder if it was possible to catch a muskie with a fly. This was an altogether different animal than a steelhead or tarpon and casting all day to cover the water with an 11-weight rod did not seem in any way practical or pleasurable. Nonetheless, I decided to give it serious try whenever I was near good muskie water. My first success with muskie on the fly took place back in my favorite waters of Wisconsin. I’d come armed with a collection of saltwater fly gear including big rods and flies better suited for sailfish. Casting all day with a large hair bug was pretty tiring but I finally caught and released a small but legal fish. That was all it took to convince me this was a sport worth pursuing. I then spent my time refining my technique and creating flies large enough to get a muskie’s attention and light enough to cast all day. For those not familiar with the muskie, it looks and behaves like a cross between a northern pike and a barracuda, only — at least in the estimation of muskie devotees — it’s stronger and tougher. While most muskie caught today are in the 30- to 40-inch range and 10 to 20 pounds, giant fish up to 50 inches and over 40 pounds are still caught every year. The Wisconsin-caught “official” all-tackle world record still stands at an unbelievable 69 pounds and 11 ounces. Even non-fly anglers know the muskie as the “fish of 10,000 casts.” That’s because the muskie sits at the very top of the predator pyramid in any waters it inhabits. As such, it has its pick of anything it wants to eat including smaller game fish, birds, mammals, and the occasional dangling toe (bright red nail polish preferred). With so much to choose from, muskie also have an annoying habit of “following” a fly but not striking — a bit like a false rise from a trout or salmon. As the undisputed king of freshwater predators, the muskie is also the subject of many a fish tale, real and imagined. Hang around muskie fishermen long enough and you’re likely to hear all kinds of stories about honey holes crowded with hungry giant muskies. The truth of the matter is that these are tough fish to catch on any kind of gear and if anyone says they can catch muskies with ease my advice is to walk away before they try to sell you some ocean front property in Wisconsin. My early experiences with muskie on the fly and many since have taught me a lot about what it takes to succeed. First, and perhaps just as important as your gear, is a strong dose of patience. We’re all fond of the saying “fisherman have patience,” but this fish really puts the cliché to the test. I’ve personally fly fished for muskie for many days on end with only a sore arm, blistered hand and sunburn to show for my efforts. Fortunately these fish have the uncanny habit of showing up just when you’ve given up hope. For the serious fishermen, this means making every cast count and watching your fly at all times. 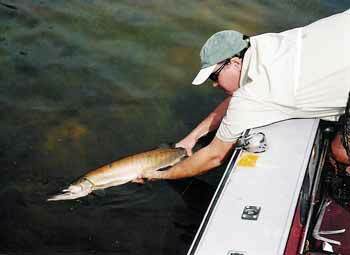 It’s not at all unusual to have big muskies take the fly right at boatside. Once you’ve mastered the mind game of muskie fishing you’ll need the proper gear. An 8½- to 9-foot, 9-, 10- or 11-weight graphite fly rod with some serious backbone is a good start. Graphite rods are perfect for this fishing as there light enough to cast all day and have good hook-setting abilities. Most saltwater graphite rods from the major manufactures are fine for this kind of fishing. The reel is not as critical a component for muskie fishing as for most saltwater species, however, as a muskie will not normally make a blistering run like a bonefish or tarpon. But they do fight hard when hooked, making alligator-like twists and turns and short but powerful lunges, particularly at the boat. I’ve fought many a muskie by stripping them in by hand but always try to get them on the reel. Good drag systems make life a whole lot easier. As for fly lines, you’ll need a heavy line weight just to carry the big flies, especially if it’s at all windy. I fish both weight-forward floating and sink-tip lines in from 9- to 11-weight sizes depending on the conditions. I also like to use my own shooting heads whenever possible to reduce casting time and wear and tear on the arm. When choosing a line look for something with a hard finish and bass bug or “Big Fly” type taper that will cast and shoot well all day. Leaders for this fishing are not complicated but remain the critical link between you and your fly. Muskie are not known for being “leader shy,” so I like a short 6- to 9-foot hard mono leader tapered to a 15- to 20-pound tippet. You can use a lighter leader but given the size of the flies you’ll find it hard to turn them over. If you’re new to this sport and still looking for your first muskie, go as heavy as is comfortable and increase the odds of landing your fish. Muskie flies run the gamut from streamers to poppers, with a common theme of large and light. By large I mean 8 to 15 inches in length, sometimes even larger. Remember, the hardware-throwing guys sometimes use lures as big as toaster, so you just can’t go too big! This is not to say muskie won’t take a smaller fly; it’s just that with the difficulty of getting this species’ attention and the lack of any serious water-pushing action, as can be achieved with a popper, you’ll need a big profile to attract big fish. With the advent of modern synthetics and hairs this task has become a lot easier for the fly tier. You can find some decent patterns in the saltwater section of your local fly shop bin or favorite catalog. But since bigger is almost always better and muskie are not finicky about neatness, you may find tying your own flies is a good option. As for colors, “match the hatch” whenever possible and use a predominance of black, white, yellow, and greens, including chartreuse. These colors imitate the primary forage in most muskie waters: perch, walleye, suckers, and ciscoes. When fishing dark or stained water, opt for the brighter colors, and tone it down in clear water. If you have to pick one color that produces day in and out, white is probably the best performer. The approach and techniques for fly fishing for muskie are as varied as the water you’ll fish and, frankly, would take more than a single article to explore. There are, however, some important behavior patterns that should help to get you started. In the spring season after the spawn and the fishing opener (May to June depending on the state) muskies tend to hang in shallower and warmer water much like their often smaller cousins the northern pike. This means focusing on shallow bays, creek mouths, and emerging weeds. Once summer starts to take hold I like to spend my time in both shallow and more open water, especially areas where you’ve got isolated structure such as rock bars or weed beds. When the water starts to cool again in the fall I move back to shallower structure paying special attention to steep breaks close to shore. It’s also important to note that whatever season you fish you’ll increase your odds if you cover as many different types of structure as possible with the fly. The first fish you see or catch will tell you a lot about the pattern for that day. While I’ve caught muskie on a fly every month of the fishing season, it’s been my experience that spring and early fall are generally best due to the higher metabolism and aggressive nature of these fish in warmer water. 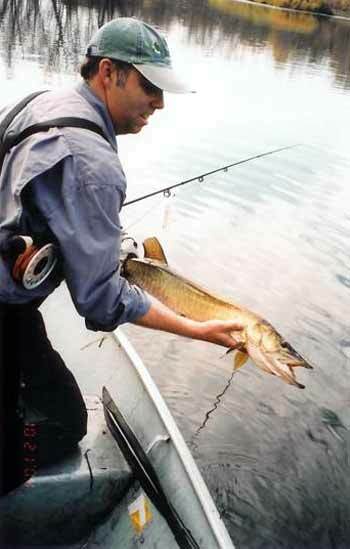 It should also go without saying that when you finally do catch your first muskie on a fly, you should release it carefully, just as you would a wild trout or steelhead. This practice along with longer minimum legal limits on many lakes and rivers has led to a pronounced increase in the quality of muskie fishing throughout the US and Canada. Cover the water: Not easy to do with a big rod and wind-resistant fly but it’s the only way to find your first fish. Change flies: If you’re not getting any action don’t hesitate to change flies. This means going from large to small, top-water to streamer, and bright vs. dark. Change your retrieve: If you’re not getting any strikes or follows, try picking up the speed — you can’t move the fly fast enough with a hand strip for a muskie! Change your depth: Depending on the season and water you might find muskies in 6 inches of water or down 20 feet or more. Always watch your fly: As noted above, muskies love to follow a fly and will often strike at the end of your retrieve (even when you’d swear there’s nothing following). Last but not least, don’t give up. Pursuing muskie is one of the more interesting and rewarding types of warm water fly fishing you can do.